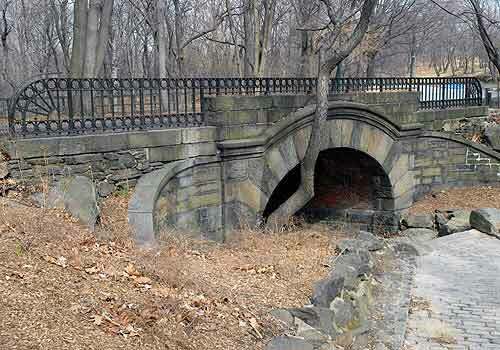 A charming stone span on the northern edge of North Meadow near the Loch, Springbanks Arch is one of the least known of Central Park's arches. Completed in 1863 with detailing done by Jacob Wrey Mould, the arch is built of stone and brick. A short flight of steps leads to a red brick underpass. On the side facing North Meadow, is a cascade that used to be known as Sabrina's Pool in the nineteenth century.